With All Hallow’s Eve just around the corner, I thought it would be a good time to review a non-fiction book of horror. Soon the spirits will be free to walk amongst us for a night or perhaps as the book indicates they are walking with us NOW! Patrick Burke became interested in military history as a young teen, later when visiting Gettysburg on a school trip he encountered his first paranormal experience. This became the first of many experiences. Jack Roth has been interested in the Civil War since the age of 6; he too had paranormal experiences that changed the course of his life. Like Patrick Burke he felt drawn to Gettysburg. 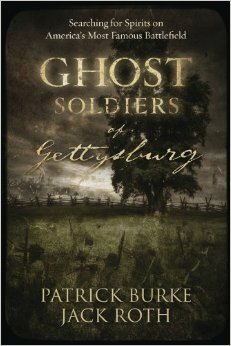 Both authors hope that by writing about their experiences in Gettysburg they are letting others share in the events our history. Both feel that by picking up on the energy left behind more details of where battles actually occurred have emerged. “We intend for this book to be the first in a collaborative series that documents compelling evidence collected on battlefields across the world.” Quite a lofty statement, but they do seem to be on the right track. The authors feel that at the moment of death the physical body and the soul can be affected by an emotional shock which could prevent one’s soul from moving on. The authors go on to explain the various types of hauntings, such as genuine, residual, object, and others. They provide some excellent arguments for their beliefs and provide historical facts to back their findings. There are quite a few encounters mentioned here that are downright eerie. A man called Brad recounts how at the age of 17 he spotted a regiment of Union soldiers marching during a trip to Gettysburg, thinking it was a reenactment group he began filming them only to see them disappear over a ridge without a trace. A few years later on TV he heard about some Japanese dignitaries who also saw the reenactment only to find out there was no reenactment presented. Several other folks came forward saying they too saw the soldiers, these soldiers are now called the Ghost Regiment of Gettysburg. Oh and did I mention, Brad actually has these ghosts on a VHS tape, yikes! This is really an interesting read; perhaps not for every horror fan but if you are a history buff or just a nut for supernatural encounters then I recommend this book for you. It can be a bit dry at times as the authors take great pains in making sure we the laymen understand how a paranormal investigation works, but I personally found it to be rather fascinating. I hope you do too. This book will be available October 8 2014 and can be pre-ordered today right here. I would like to give my testimony of a visual sighting of the elctric or photonic body (light body) of my deceased dog in 1997. Please contact me if interested.